WASHINGTON – Public transit use rose across Arizona as the number of miles driven dwindled, according to a new report that called for shifting funds from “unnecessary” highway projects to mass transit. The report from the Arizona Public Interest Research Group said bus and rail ridership grew across the state from 2005 to 2010, largely driven by increases in Phoenix and Tucson. As mass transit grew, the number of miles driven by Arizonans per capita fell by 10.5 percent from 2005 to 2012, the report said. Diane Brown, executive director for Arizona PIRG and an author of the study, attributed the changes to more millennials and seniors eschewing cars in the state. “We have seen a tremendous opportunity for the increase in the public – particularly in the Phoenix area – to use public transportation,” Brown said, noting the city’s growing light-rail line and ridership. Brown said current transit systems are working well, but they need to grow. “Transportation officials need to look at the best ways to expand those systems and ensure that every individual who wants to use public transportation has an opportunity to do so,” she said. Brown said that state and local agencies need to re-evaluate their transportation plans to accommodate the new trends by reallocating funding from unnecessary highway projects to benefit public transit. But an Arizona Department of Transportation spokeswoman said the state already balances highway and mass transit options. Laura Douglas said the state takes a long-term view of highway planning, leaving local planning to local officials. In addition to highways, ADOT is also studying multimodal methods of transportation, such as a commuter rail connecting Phoenix to Tucson and Las Vegas. Highways are still necessary to the state’s economy, Douglas said, because they connect Arizona to markets like California, Texas and Mexico. Improvements to highways would then lead to improvements in the economy. A spokeswoman for AAA Arizona welcomed the report, saying that anything that elevates the discussion about transportation is a good thing at a time when funding for highways is dire. 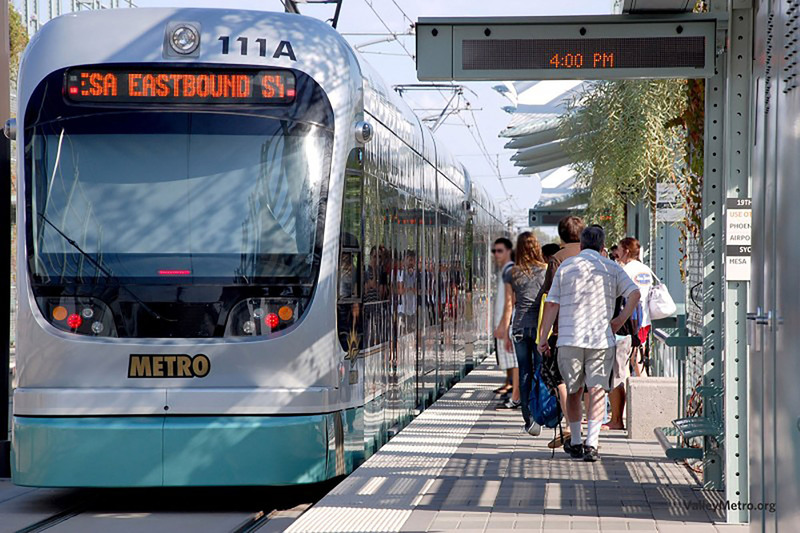 The report said that mass transit trips taken in the Phoenix area rose by 16.1 percent per capita from 2005 to 2010, thanks in part to the light rail, which has seen ridership levels not expected until 2020. Tucson saw a 24.6 percent increase in trips per capita from 2005 to 2010, the report said, and the average number of riders per day on Yuma County Area Transit tripled from 2011 to 2014. 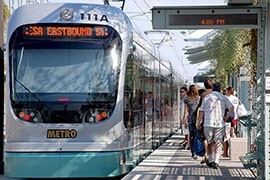 Riders board the light rail at the University and Rural station in Tempe. Light-rail ridership has already reached numbers projected for 2020, said a report from the Arizona Public Interest Research Group, helping drive an overall mass transit increase in the state.